Perhaps, we reasoned, Per Kirkeby would allow us to construct a small modular brick column such as those in his solo exhibition ‘Fliegende Blätter’ at Museum Folkwang Essen in 1977. Not a large institution or public-facing commissioning body – the contexts for most, if not all, of Kirkeby’s brick sculptures – but a non-commercial artist-led live/work space in East London’s Whitechapel, Piper Keys kept its proposal modest: to stage two simultaneous solo presentations, the first, in the gallery space, by Norwich-based artist Rob Filby, and the second, by Kirkeby, in the communal living area. While Filby’s exhibition would be part of the gallery’s ongoing programme of six-week solo presentations, occurring between Samuel Jeffery and Lucy Stein, Kirkeby’s sculpture, once constructed, would theoretically remain until the time Piper Keys vacated the building. So it was with pleasant surprise that we read the email of Kirkeby’s partner, Ann Marie Duus, happily offering us a previously unrealised work. Titled Stenalt, originally designed to screen a tree on the goat farm of Kirkeby’s friend and former assistant Arne ‘Myko’ Fremmich, the plan drawing came, unbelievably, with dates of Arne’s availability (we only had to cover the hotel) to oversee the build. 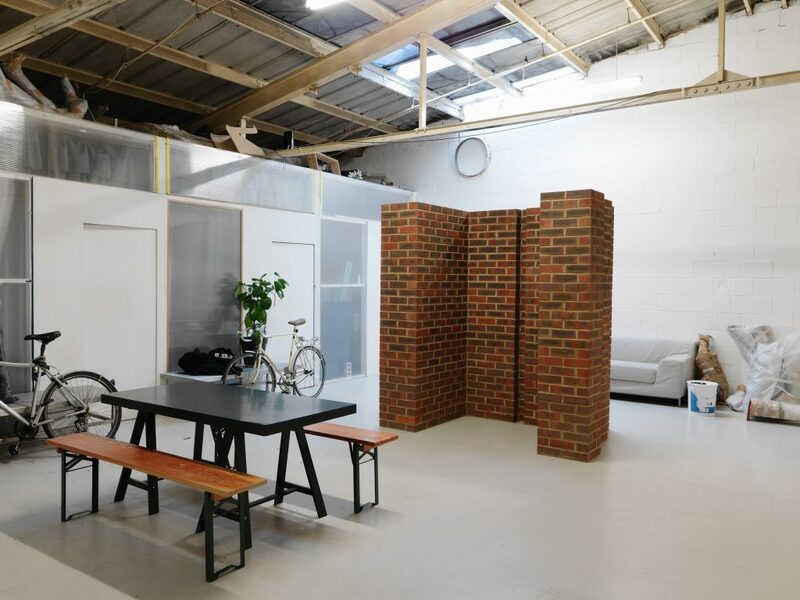 We were captivated, as Kirkeby must have been too, by this transposition of Stenalt from its intended rural setting and relation into this communal domestic space, alongside a makeshift kitchen, other residents, sofas and bikes, situated in one of London’s most cosmopolitan boroughs. No other Kirkeby brick sculpture had been built in such a setting. With Arne advising two Polish bricklayers, the build commenced at the end of May 2014, two weeks before the exhibition opened on 8 June. Coincidentally, London had last hosted an outdoor Per Kirkeby brick work 28 years earlier on the very spot then occupied by Martin Creed’s brick wall, Work No. 1821 (2014), on the Hayward gallery’s sculpture terrace, as part of his solo exhibition ‘What’s the point of it?’ Creed’s sheer three-and-a-half-meter-tall wall was of ‘facing’ coloured brick bands – yellow, blue, red, and brown; the patternation running through its structure. With this work Creed seemed to revel in its seriality, while amusing at the gesture of screening out the view of the river Thames beyond. Kirkeby’s own earlier brick work, exhibited in the 1986 Hayward Annual, that year titled ‘Falls the Shadow’, was of a different seismic order to Creed’s. Uniformly red brick, four shallow arches span outwards from the centre of a low, broad cross-shaped base, joining as many squat split-columns at its ends. The arches divide the cross along its two axes to create four apportioned quarters. It appears artless, a Barratt Homes bricky’s accomplished take on ornamental seating, and might have been easily overlooked as street furniture. In documentation of both Kirkeby’s and Creed’s works, the mortar bond that cements structural form to architecture seems incontrovertible – as if these things obdurately will remain. But the presence of Creed’s brick wall disproves this, as it too, in turn, has been cleared from the Hayward sculpture terrace. Today, Kirkeby is primarily known for his ‘lyrical expressionist’ paintings. A trained geologist, enthusiastic traveler and amateur anthropologist who has written extensively on his art, he began using brick in 1965, exhibiting a mortarless block, ten bricks high and one and a half bricks wide, at Copenhagen’s Holbersgade gallery. A year later, in 1966, Carl Andre began exhibiting his ‘Equivalents’ series. Equivalent VIII (acquired by Tate in 1972, only becoming contentious in 1976) consists of 120 fire bricks stacked evenly in two layers. The astringency of these works, devoid of artistic dexterity or graphic quality, are an attempt to strip narrative. Bodily connotations are diminished to emphasise the act of pure visual perception. By the early 1970s Kirkeby had begun mortaring the brick seams, initially realising an architectural sculpture of a house in miniature, Huset (1973), followed by a functional sculpture for smoking fish, Räucherofen für Fische (1975). Both were sited outside: the former in a Danish housing development, and the latter in a coastal garden. Into the ‘80s and ‘90s the brick works developed alongside Kirkeby’s painting and drawing practice, varying in siting (in the gallery, but mostly outside in natural landscapes), scale, form, and occasionally function, while maintaining a resolutely conceptual logic. Many of his larger, later public commissions – throughout urban and rural Europe – share a monumental uncanny sense of incomplete architecture. Yet they shrug off any conventional language of architecture: windowless windows look into inaccessible spaces; ‘shadow joints’ create pockets of blackened air; interior space is irreconcilable with exterior volume. For Kirkeby, it makes no difference in principle whether he constructs the sculptures himself or others do. Speaking directly to this question of domestic economy, as well as transposition, Arne scaled the work for the space in such a way that it felt ‘right’, indirectly matching the scale of individual bedrooms, establishing a dialogue between volume and value of rental property and art (here not a commodity that could circulate, though of immaterial value). Its mortar bond with the concrete floor intensified its presence. In his essay ‘Sculptures of brick’, Kirkeby celebrates the use of bricks for achieving a desired aesthetic quality of anonymity. ‘In a certain respect,’ he writes, ‘the brick sculptures possess a very clear appearance: they call attention to the anonymity of the work as an entity that cannot be ignored. Anonymity is a paradoxical aspect of any masterly work of art. Elderly painters often achieve near-horrifying anonymity in their work: an “emptiness” that is the result of much effort.’7 Imposing yet, paradoxically, unintrusive in its aesthetic blankness, even in spite of the brick’s deep history, Stenalt, and more generally the brick works of Per Kirkeby, choreograph bodies, activating space. It is never the other way around: somehow the anonymity deflects identification. For Rogers, the work activated a kind of classic but unlikely modernist-utopian vision of community through art and architecture. ‘Stenalt’s scale and volume,’ he told me, ‘was that of a small group of people, and these human dimensions/scale lent themselves to both a bodily and group experience (both in the sculpture’s intensive fabrication process and use-value as screen/booth/podium)’. This felt particularly meaningful against the superficial visual effects of the metropolitan contemporary art world, and mirrored our – the directors of Piper Keys and myself – own ongoing concerns regarding how art practice might engender alternative communities. 1 Per Kirkeby (2012), ‘Sculptures of brick’, Writings on Art, Spring Publications, Kindle ed. 3 Per Kirkeby (1991), Haandbog, p.39. 4 Lawrence Leaman, email correspondence with the author, May 2017. 5 Jacques Rogers, email correspondence with the author, May 2017. 7 Per Kirkeby (2012), ‘Sculptures of brick’, Writings on Art, Spring Publications, Kindle ed. An expanded version of the text above will be published in a forthcoming monologue published by Cahiers d’Art. Per Kirkeby at Piper Keys is included in their recent publication Per Kirkeby Brick Sculptures.